I'm off to lunch today and will probably be wearing this. Cast off last night. What a lot of garter stitch. It could have had a slightly wider green border but I was sick of it. The 100 metres in the next ball would have given me only about eight more rows maximum and I decided the effect wasn't worth the effort. The effect of the short rows can be easily seen here with the shawl on the floor, even though it's unblocked as yet. Larger photos by clicking on image. The colours are not really accurate here. The black is an intense, deep black and the green is a rich forest green without the blue tinge at all. They look good together and even unblocked the shawl is large. 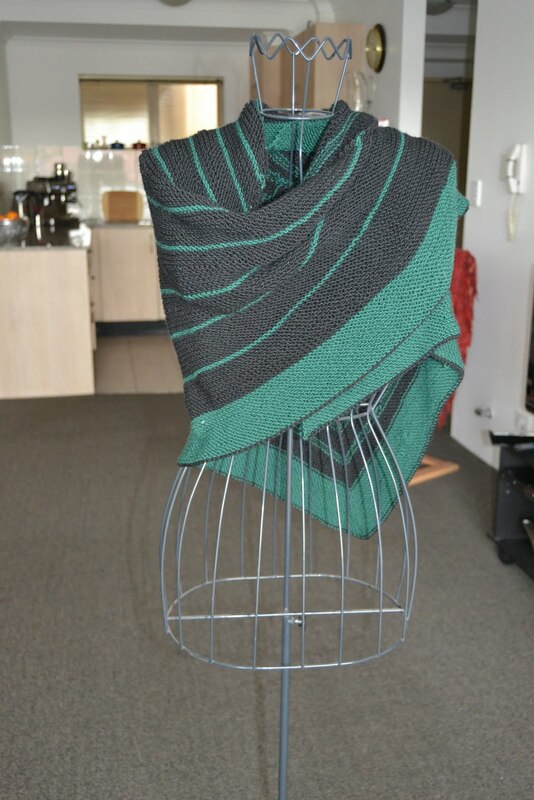 The designer has another shawl, really more like a scarf done using similar principles with short rows. I like the result but can't face more at the moment, although the scarf is smaller. Here it is on my model keeping her warm. It's a good deal warmer than yesterday and the gale force winds have dropped. I went out as I do most Wednesdays and was waiting for my usual bus. It didn't arrive. Neither did the next one. Ten minutes after that a bus came, I don't know whether it was either of those two or the next one early. It made little difference to me. I was very warmly dressed with a hooded, quilted silk jacket. I'd been at the south facing bus stop in a gale for almost 45 minutes. I was cold. I don't know if it was the weather or some accident or what but the traffic was appalling. Sydney grinds to a halt in on the roads in bad weather. When I was still at least twenty minutes away from where I change buses, I was about a kilometre down the road, stuck outside Ashfield Park. I came home. I would have been arriving when everything was over. So it's cold enough to dress up my model. Actually all my grandchildren are offended by her and also by her several equally unclothed cousins at DIL's place. I find it amusing but all things considered I'd rather they had some sensibility like that. It's not a well composed shot at all. The slash of red next to the model is actually a rug over a chair behind her and the frame of the chair can be seen on the floor too. The window in the rear of the picture opens onto the common courtyard area contained inside the building. Rather than upload a huge lot of photos, here's a slide show you may find interesting. It's the replacement of a huge advertising poster over from where I am. I had a lot more photos but have edited these. Mostly cropped out is the road. Parramatta Road, one of Sydney's busiest roads is directly under where these men were working. The wind was blowing a gale and one of them had no safety harness.. Here's the link. Posters in a gale. I was scared watching them work. I think your new shawl is just beautiful and so stylish!! Even on the dummy. Those poster men were very game, weren't they?? Hope it's not too cold this weekend and that all your buses come. At once!!! I think the shawl is lovely but I understand the "sick of it" thing. I felt like that about a "no purl" scarf recently - it may have had no purls but one had to bring the yarn forward as if to purl before slipping the stitch, so I may as well have been doing the purl stitches! The weather was awful yesterday, but I didn't have to go outside at all (except when GS#1 escaped through the front door and went to visit the neighbour's toys!) so I barely noticed it! 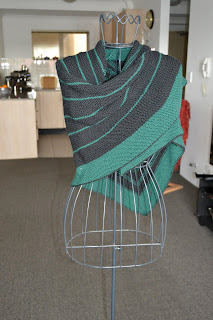 I love the shawl Jan. All of that garter stitch was worth it in the end!